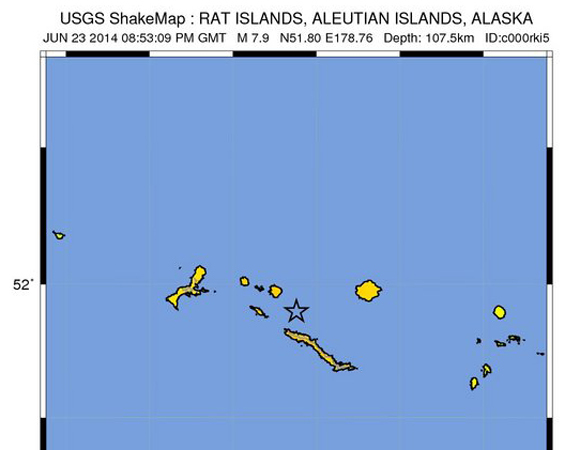 The June 23, 2014 20:53 UTC earthquake in the Aleutian Islands, Alaska, occurred as the result of oblique normal faulting at moderate depths. At the location of this event, the Pacific plate subducts northward beneath the North America plate at a rate of approximately 59 mm/yr. 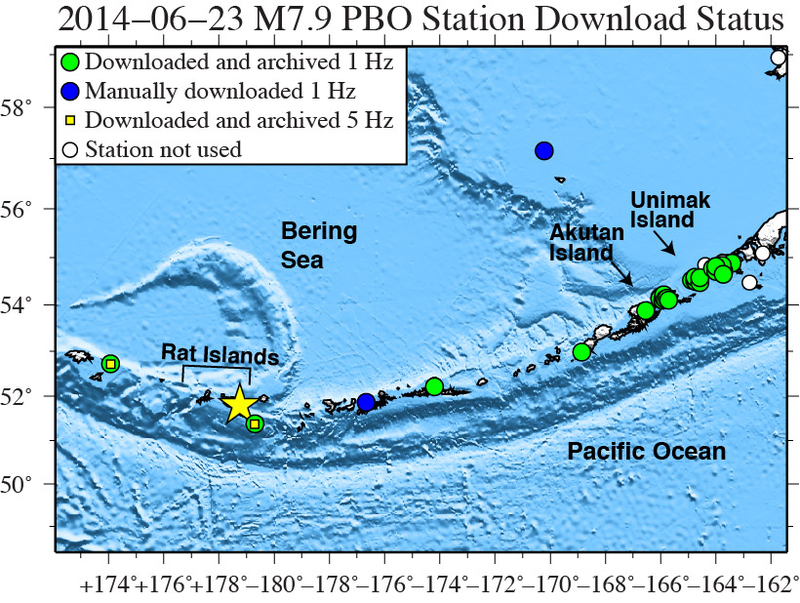 The mechanism, location, and depth of the June 23 event indicate that the earthquake likely occurred within the subducting Pacific plate, several kilometers beneath the slab interface. 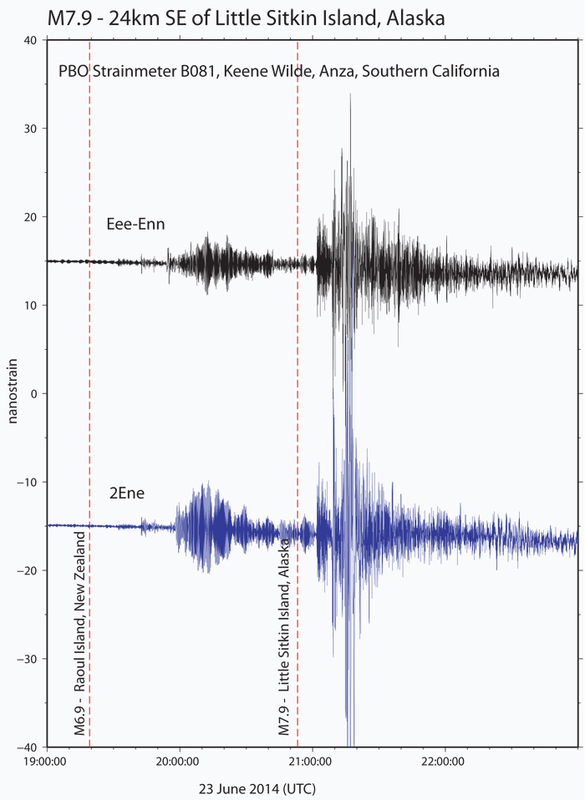 The locus of the June 23 event is a very seismically active region, with 26 events of M 7 or greater having occurred within 250 km since 1900. Notable events include an M 8.4 in 1906, M 8.7 in 1965, and an M 7.9 in 1996. Unlike the June 23 event, many of these events occurred at shallower depths, likely along the plate boundary interface. 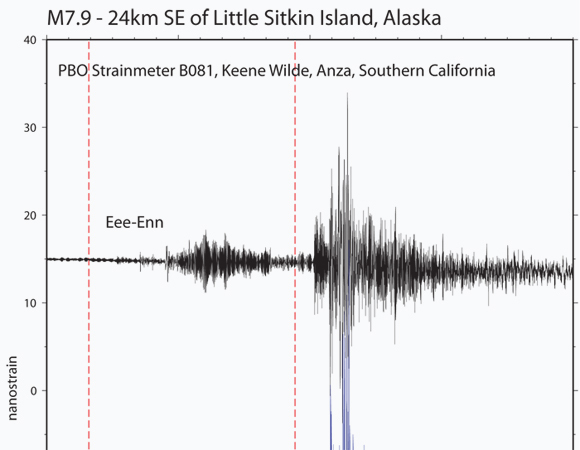 In response to the June 23, 2014 magnitude 7.9 earthquake 24km southeast of Little Sitkin Island, Alaska, and its series of aftershocks, UNAVCO is currently downloading and preparing the following custom datasets. As of July 24, 2014, UNAVCO has downloaded high-rate GPS data from 26 PBO stations within 1,000 km of the event epicenter (Figure 1). One-sample-per-second (1-sps) GPS data were collected for a 6-day period (± 3 days) around the event. 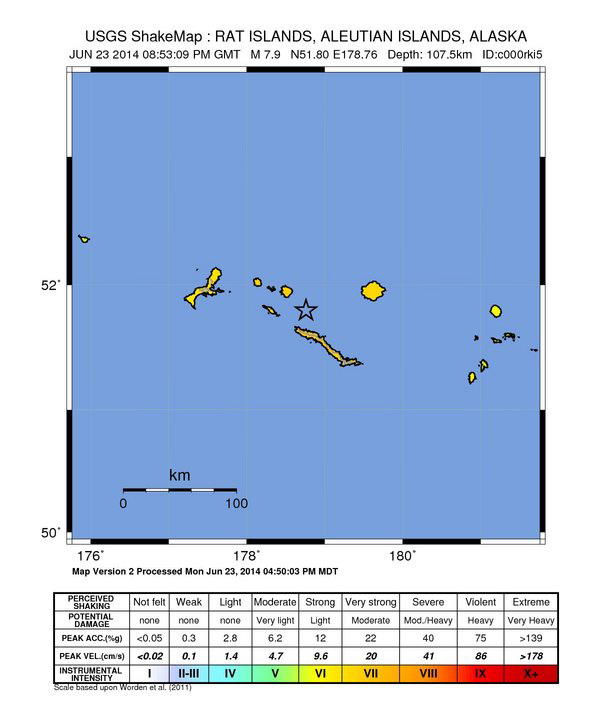 Available five-sample-per-second (5-sps) GPS data were collected for a 12-hour period (± 6 hours) around the main shock, though very few stations in this region support 5-sps data. Most GPS receivers in this region are not configured to record 5-sps data because memory capacity is preferentially dedicated to long-term storage of standard-rate and 1-sps data, as these sites may be impossible to reach via communications or site visit for long periods of time due to their remote locations. High-rate GPS data are accessible from ftp://data-out.unavco.org/pub/highrate/. Four GPS stations in this region, on Unimak Island, provide 1-sps real-time data streams. Raw and PPP RTX-processed real-time data can be accessed by sending an email request to rtgps unavco.org. The GAGE GPS Analysis Center Coordinator will estimate coseismic offsets for any stations that experience horizontal displacements of > 1mm. If such offsets are observed then station offset files will be made available from ftp://data-out.unavco.org/pub/products/event/. For this and other BSM datasets, go to the PBO borehole strainmeter Geophysical Events page. UNAVCO operates several tiltmeters in the region that were operational during the event. They record at 1-minute sample interval. Plots can be viewed and data accessed from http://www.unavco.org/data/strain-seismic/tilt-data/tilt-data.html. 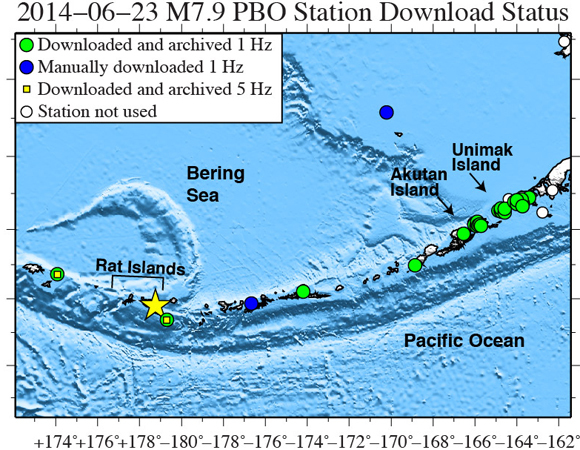 PBO seismic data (1-sps and 100-sps) are available from the IRIS DMC under the network code “PB”. The nearest PBO seismic stations are located in the Pacific Northwest. PBO seismic data can be accessed from http://www.unavco.org/data/strain-seismic/seismic-data/seismic-data.html and http://www.iris.edu/mda/PB.